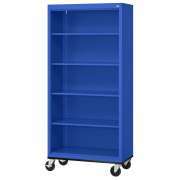 Classroom bookcases will make an excellent addition to your learning space. When you include great bookshelves as part of your classroom furniture, you show students how important it is to read. Hertz Furniture&apos;s wide selection of sizes and styles will enable you to find a perfect fit for the space you have. What do you need to create a library for your classroom? Both our steel bookcases and our wood bookshelves will provide superior support for your classroom library, but they aren&apos;t just about storage and display. 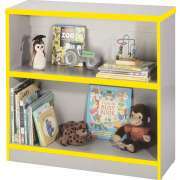 Classroom bookcases can also be used to brighten up the room while encouraging students to broaden their horizons. 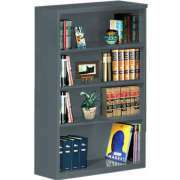 What are the advantages of steel bookcases? Steel bookcases are extremely strong. 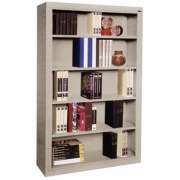 They come in a variety of heights, widths and depths so you can choose the perfect size for the books you want to house. 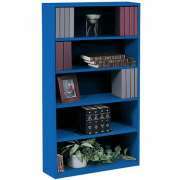 Sandusky Lee bookshelves are constructed from 20-gauge steel. Each shelf holds and incredible 150 pounds, so they can support anything from novels to textbooks and even encyclopedias without warping or getting bent out of shape. 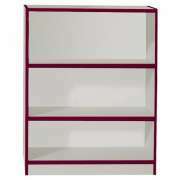 A great benefit of steel bookshelves is the incredible selection of colors. There are vibrant shades to fit in with or complement your classroom colors, and more subtle tones that will help colorful covers and titles really stand out. 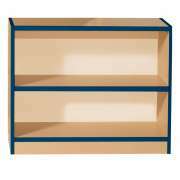 If you have a big space for books and want a lot of literature in your classroom, you can buy a few bookcases in different hues and use them to color-code books by level or topic. Should I get wooden bookshelves for the classroom? Wooden bookshelves are a great choice for a learning space, especially one where there are other pieces of wood classroom furniture. They bring a calming natural appeal into the classroom while providing an attractive space for your books. Wood is tough, sturdy and timeless. If you like the natural appeal of wood but want something bright as well, Educational Edge bookshelves combine classic natural wood with a splash of colored edge banding to create a vibrant learning space. 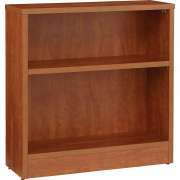 What is the best height for classroom bookcases? When encouraging children to read, it is important to make sure that you supply literature at the right age- and eye-level. The Modula S System from Gressco comes in two creative classroom bookcase configurations that will fit in perfectly in a preschool or daycare setting. 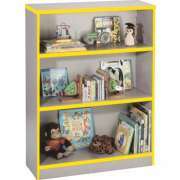 It keeps books low down so even little ones can take them off of the shelf and read independently. These bookcases are made from Maple plywood and are perfect for an early childhood learning center. 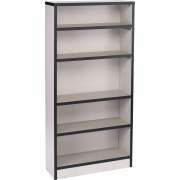 Should I get single- or double-faced classroom bookshelves? 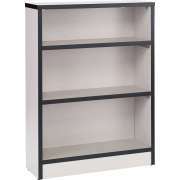 Classic classroom bookcases come in either double- or single-faced units. Single-faced units are meant to be placed against a wall. If you have more space in your classroom, or you want to create aisles, double-faced bookshelves can stand independently anywhere in the room. 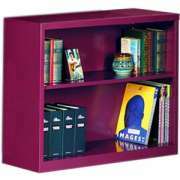 To get the benefit of double-faced bookshelves at a more budget-friendly price, you can fasten single-faced shelves back to back. 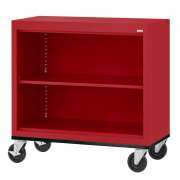 Mobile bookcases offer a great way to create a portable library. 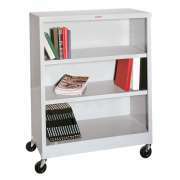 With all of your books on wheels, it&apos;s easy to rearrange the room or move volumes back and forth between rooms. This option is especially convenient if you share reading materials between classrooms or need to lock your materials away in a storage closet after class. 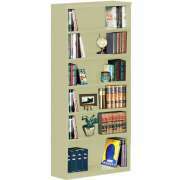 Adjustable wooden bookcases are always convenient to have. Most people replenish or change their classroom books over the years, and adjustable bookshelves ensure that your literature will always fit in the space you have. 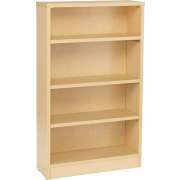 If you like to keep extra-large books such as encyclopedias, reference books or extra textbooks in your classroom, you should consider purchasing extra-deep shelves so your books won&apos;t stick out and get knocked off of the shelves. Do I really need a classroom library? Books are an integral part of the learning process. They help students develop language and research skills as they accumulate knowledge in various areas. Classroom bookcases offer a great way to create a reading corner, display suggested literature for projects and encourage students to read books that are relevant to topics learned in class. A teacher can benefit personally from bookshelves in the classroom as well. They can provide a space for reference books that he or she needs while demonstrating to students that reading is a lifelong endeavor. 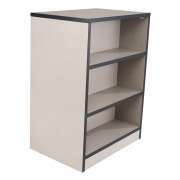 If you are looking for a fun and educational way to enhance your students&apos; learning experience, classroom bookcases are a great choice. They offer the opportunity to bring bright colors and new ideas into your study space. At Hertz Furniture, we know that designing the perfect classroom layout can be a daunting task. If you need help determining which is the ideal bookshelf for your space, don&apos;t hesitate to call the Hertz Design Center for free project-planning advice.